Does what the title says, removes the ugly dirt that gets stuck on your face after you load a vampire character save. 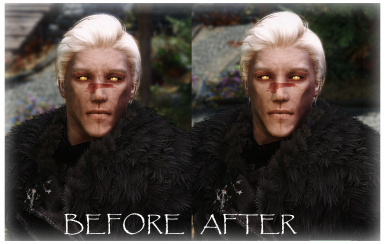 Replaces tintmasks (dirt) textures for both genders. Note: This replaces all the three tintmasks with empty textures so you won't be seeing any NPC's face covered in dirt anymore, side effect. Q: What's different from the original mod? A: The original only replaced the dirt for "headdirt_01", this however, replaces for all three "01, 02, 03". A: Cause only making one dirt texture blank wasn't working. Q: What does this do again? A: Removes the ugly dirt added to your character after you become a vampire. [Sometimes the dirt is not visible in vanilla game, but after loading the same save, the dirt pops up, this will fix it].